Trikes and (odd) bikes. : 28th August 2017 Misty-eyed lansdscape photography. 28th August 2017 Misty-eyed lansdscape photography. Monday 28th 52F, 11C, woke early to a quiet morning. Blue skies are decorated by small clouds. A wonderful mist hangs low over the newly harvested fields but is thinning rapidly. Yesterday's machine roar and movement are now safely stored on my computer for posterity. It's really quite exciting to see these huge machines so close to home. The dust they spew out the back is unbelievable but the light wind was perfectly placed to carry it well away from us. A large tractor and trailer accompanied the harvester to gather the grain and ferry it away at intervals. Leaving the soil littered with finely shredded straw and seed husks. Of which I saw a great quantity today as I took the unique opportunity to cross harvested fields. My boots brushed through the stubble as I hopped over moraines of hay waiting to be baled. Everything looked slightly soft focus in the misty, morning sunlight. Only such gentle elevations would show such change when the crop is absent. Suddenly distant vistas are clearly seen for the first time in months. Just having access to the fields offers new insights into the layout of the land. New opportunities for photography present themselves. The problem is choosing which images to share from the hundreds I have taken. Resizing them robs them of sparkle and the sheer scale of everything. The moment I raise my camera the landscape is squashed down into a tiny box and never really expands back out again. I can never capture the 180° and occasional ten mile depth of the landscape at the same time. Zoom in and everything is foreshortened and squashed further into the limitations of a screen. Then it all has to be shrunk in the wash as I prepare my images for the blog. Too large and people complain that they can't view my blog because it takes so long to download. After years of high speed fiber-net I have to keep these slow connections in mind. I expect my regulars will be sick of the sight of harvest scenes before I am finished. They're probably already hoping for a new rant about McSlob's litter or vehicular 'nutters' driving me round the [blind] bend. Well, you'll just have to be patient. It's my blog, so there. Start your own blog if you want to see something else on your own screen. I highly recommend it if you have anything to say. Or are burning to share images of your life and hobbies. You can never have enough blogs. Even if nobody ever reads them. I had a nice email from a chap who's bought a long wheelbase, delta trike. 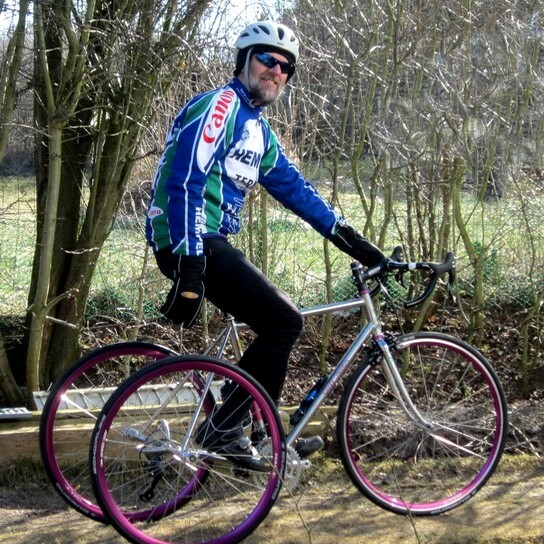 With an electric assist front hub and disk brakes he's enjoying his new found freedom to roam. The nice thing is that the styling denies the narrow-minded the ability to auto-label the trike as suitable for the elderly and infirm. It looks like a smart and sophisticated recumbent and that is precisely what it is. I wouldn't mind one myself when I retire from perching high on a Brooks saddle with my nose on the front tyre and my bum in the air. Well, that's how it feels these days. Even though I rarely move my hands from the Campag brake hoods.